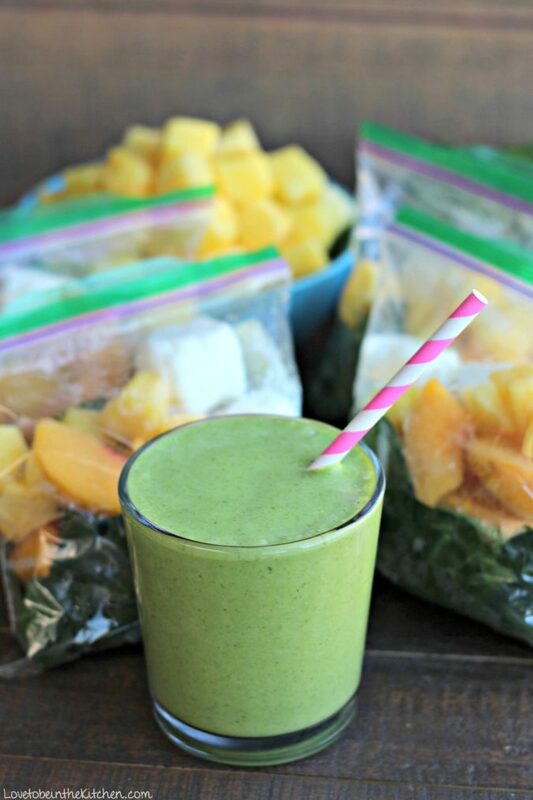 Detox Green Smoothie Freezer Packs- Easy to prep and ready to enjoy when you are! Just add liquid and enjoy a boost of vitamins, minerals, and nutrients! My life is so busy lately but I’m trying to find easy and delicious ways to eat healthier despite the craziness of life. I recently shared with you my absolute favorite green smoothie recipe! My Detox Green Smoothie recipe is the best green smoothie I’ve had and bonus, my kids love it too! Even though it doesn’t take that long to make a smoothie I tend to not make smoothies as often if I don’t have freezer smoothie packs ready to go. So today I am sharing you this fabulous Detox Green Smoothie Freezie Pack recipe to make your life easier and healthier! A few years back I shared with you a tip on how to freeze fresh lemon and lime juice. Since I posted that, every few months I buy a bunch of limes and lemons to freeze the juice. Having that fresh juice on hand is a lifesaver! Since this smoothie recipe has lime in it you’ll be freezing the juice and zest of a lime. 1/2 a lime per smoothie pack. You will also be freezing Greek yogurt in cubes as well. This silicone ice cube tray in my picture is now discontinued but I highly recommend this Easy-Release Silicone Ice Cube Tray. You can double check the volume of the ice cube by measuring water in it first. Mine holds 2 tablespoons each so since the smoothie pack calls for 1/4 cup Greek Yogurt I added 2 tablespoons in each cube. It works great! A fantastic tip to make it quick and mess free is to add the Greek Yogurt to a sandwich bag, cut the tip and squeeze it into the ice cube trays. 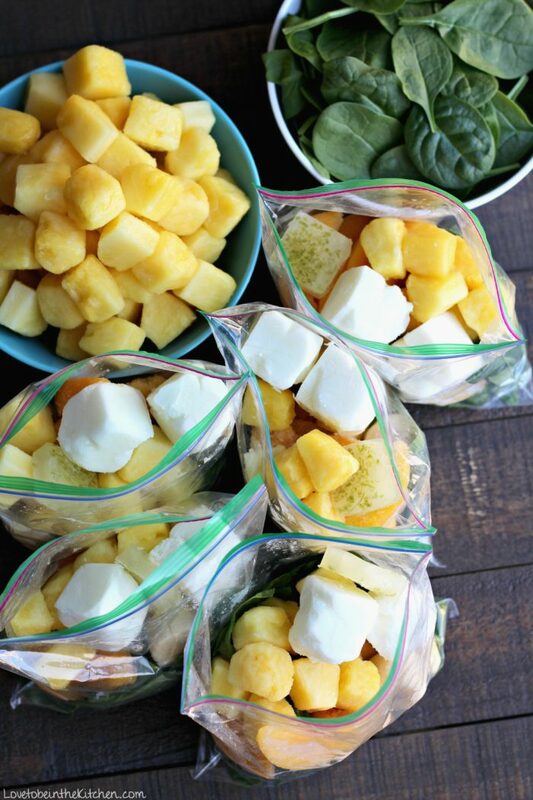 Once it’s frozen, you will add 2 cubes of Greek yogurt to each smoothie pack. It sure makes life easier! With the lime and Greek yogurt frozen, it’s time to assemble! 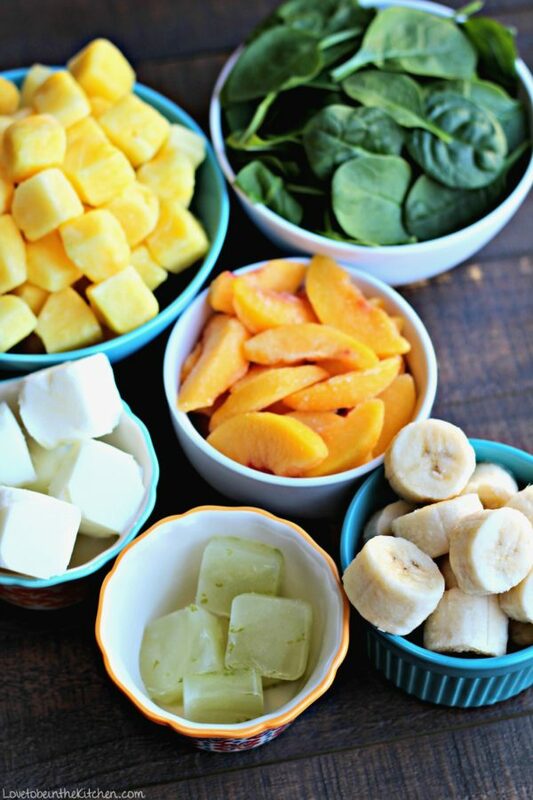 This smoothie pack recipe calls for Greek Yogurt, lime juice and zest, bananas, peaches, pineapple, and spinach. Feel free to add the optional additions in the packs or when you are ready to blend the smoothie. The optional ingredients are chia seed, ground flax seed, ginger or cinnamon. It doesn’t take much time at all! 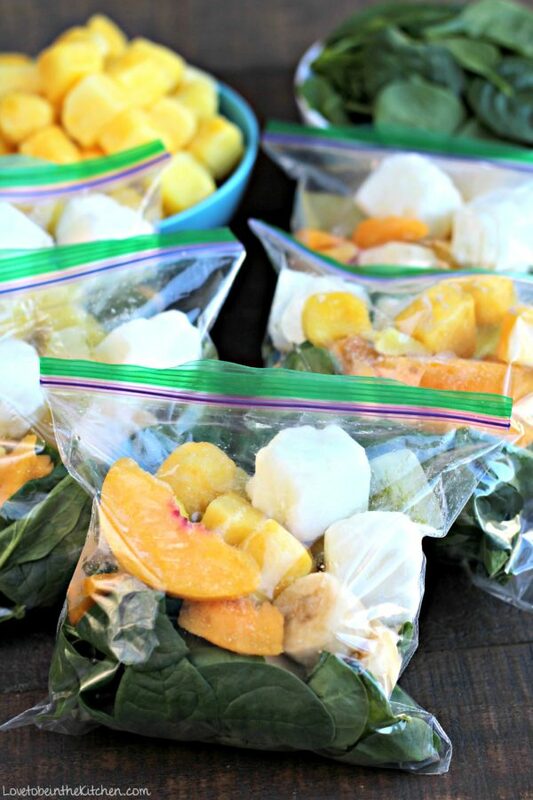 And to not waste plastic, you can reuse the zip top bags after using with more smoothie pack ingredients. Yay for a delicious and healthy smoothie as soon as you need it! This is perfect for busy mornings or a quick snack! I love that when my kids ask for a smoothie within minutes I can have it waiting for them! Optional: ½ tablespoon ground flaxseed and/or chia seeds, ½ teaspoon freshly grated ginger and/or cinnamon. Ingredients are enough for one smoothie pack. Decide how many smoothie packs you want to make then times the recipe ingredients by that number. 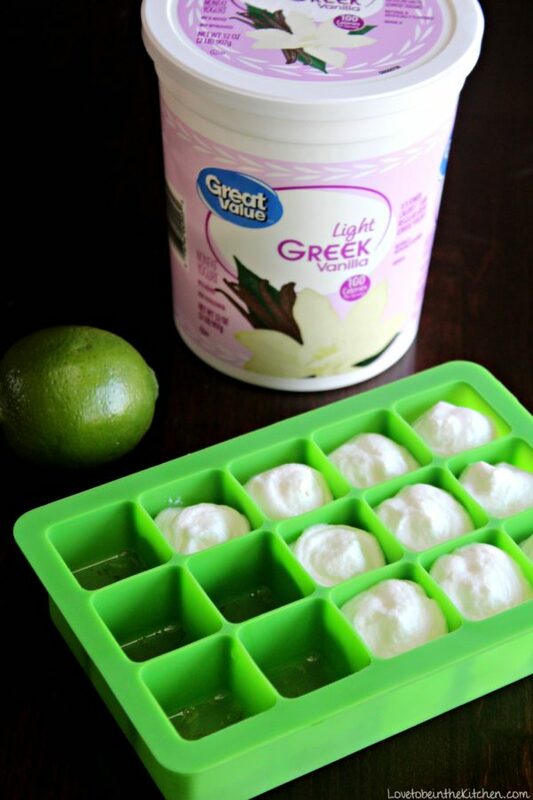 Freeze the Greek yogurt and lime + zest in a silicone ice tray or regular ice cube tray. (See post for more details if needed.) Once frozen, assemble the smoothie packs. In a small zip-top bag add all the ingredients except the liquid. Remove as much air as you can then place in freezer up to 3 months. When ready to blend, add the smoothie pack contents to a blender, add ¾ liquid (water, apple juice or milk of choice and blend until smooth and no spinach flecks are visible. Add more liquid if needed. What a great make and freeze ahead idea!